The mother mushroom may sink or float, it does not matter that much. The new baby mushroom that forms will form on the surface. 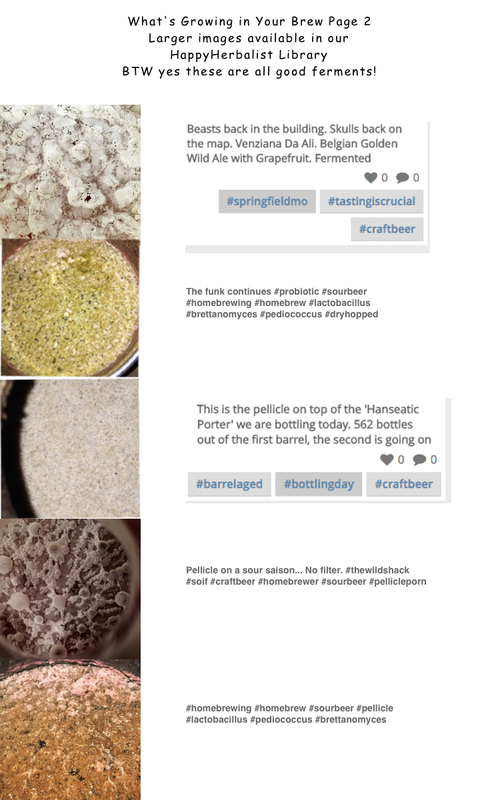 The Mushroom / Pellicle/ SCOBY/ Gelatinous Mass will reveal the health of the bacteria and yeasts that are in your brew. Creamy Smooth thick and tough is perfect. Unlike MOV - Mother of Vinegar, which looks like a SCOBY. when the MOV sinks ,they say its dying. 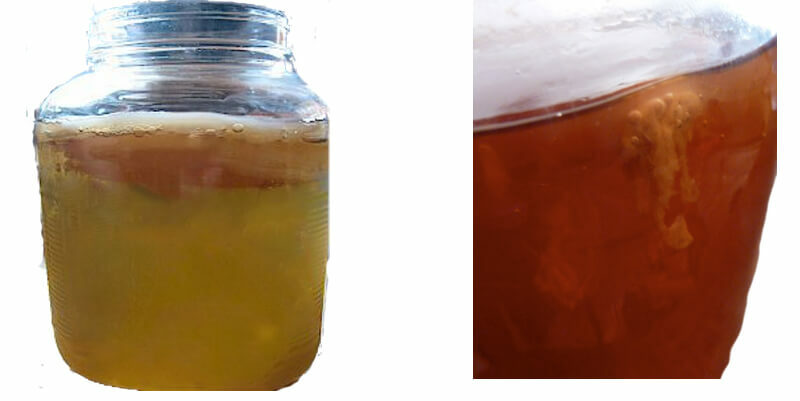 With Kombucha the SCOBY travels around, may sink or float or go on its side and then maybe right itself. This movement is due to the activity of the yeasts and the carbonation (bubbles) the yeasts produce. MOV does not have an active yeasts present whereas Kombucha does. Don't worry if your mother SCOBY sinks. It will still produce a new Baby Mushroom (SCOBY) on the surface of the ferment. On the pictures above you can see the Carbon Dioxide accumulated in the interface between the pellicle (mushroom) and broth; this separated the mushroom from the broth and lifts it up.and eventually, may block the transfer of nutrients and oxygen to the bacteria. When the bacteria and yeast are balanced and the Time and Temperatures right, life is good and the mushrooms look beautiful. Kombucha Tea and Life is as it should be. The first portion of the ferment cycle, days 1-3, the yeasts are most active. The yeast are in a "Respiration" stage, reproducing more yeast and giving off Carbon Dioxide (carbonation)in the process. As the dissolved oxygen depletes, the yeasts are forced into "fermentation" where sugar is utilized (cleaved into glucose and fructose) and the yeast "breathe" via glucose, and reproduction declines. 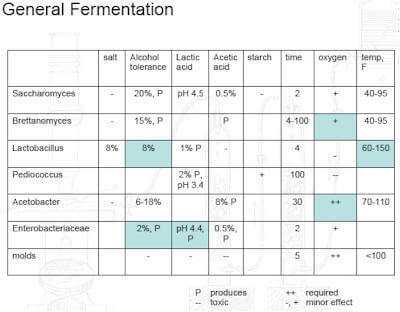 Greater amounts of alcohol are produced at this fermentation stage.As the yeast population declines the bacteria originally crowded out by the yeasts, begin to multiply as they feed off the alcohol produced by the yeasts. The production of the cellulose mat / mushroom help the bacteria seal off oxygen from the yeasts thus forcing the yeasts into greater production of alcohol (fermentation) which the bacteria prefer over the glucose. This balance between Yeast and Bacteria and Oxygen and Carbon Dioxide is critical in creating the best Kombucha Tea Ever. More about this later. Fortunately one need not worry too much, as nature takes its course. When we see the yeasts, its their dead and dying bodies that pile up. Sounds gross, looks grosser. But this sludge is full of vitamins and nutrients.People spend good money on purchasing the dried version at the health store. Loaded with Vitamin B. More importantly, it is these yeasts cells that add flavor and character to the brew. This is what we taste in Kombucha Tea. The actual tea adds only a slight flavor while the yeast adds the body. Yet remember its the balance thats important. More on yeasts later. Not every ferment turns out great. But if it smells good, taste good and looks OK then its probably OK. There are only a few things that can actually go wrong. 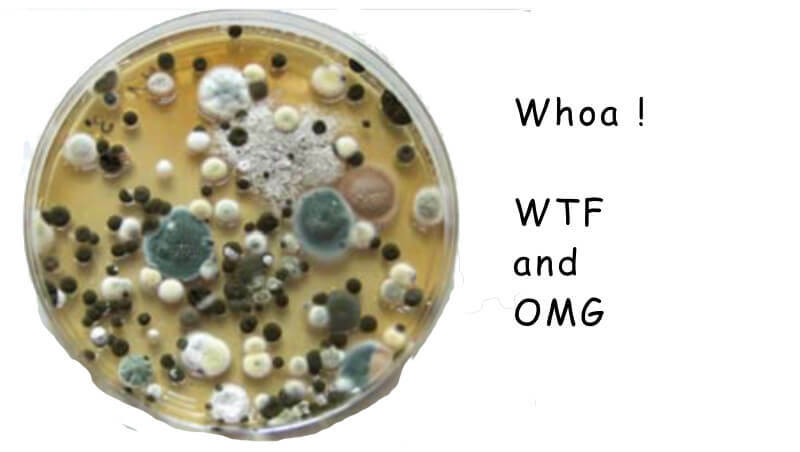 In the first few days, when the batch is most at risk, it is difficult for a newbie to tell the difference between mold and mushroom. Wait a few more days and it will be clearly mold or clearly not mold. 2. Vinegar Flies (Fruit Flies) . Vinegar flies go after the yeast and the liquid ferment. Leave babies that hatch and the larvae eat 1-2 inch trails out of the mushroom. The Kombucha continues to survive and thrive. Folks use their own discretion. 3. Vinegar Eels. Vinegar eels eat the bacteria and destroy the mushroom and hence the ferment. They are visible and may contain any vinegar product. Have to discard, sterilize and start over. Non toxic to humans. A few folks will continue to drink the tea. 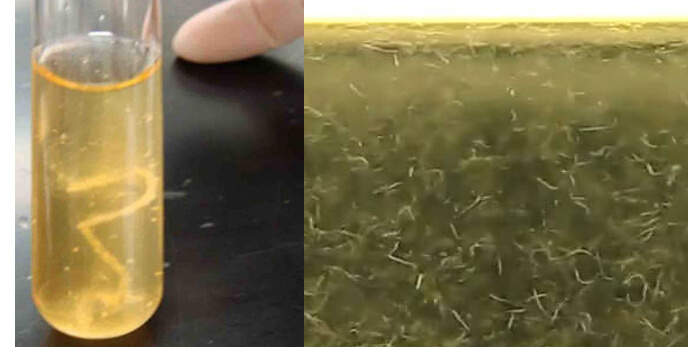 Vinegar flies (left) and Vinegar Eels (right) magically appear. neither are toxic to people. Fly larvae and eels look alike. Larvae will fly away. Eels are forever, and will necessitate tossing out the entire batch and sterilize. These bugs may ride in on tea or sugar or the fruits used. More likely on Organic stuff as they don't contain any pesticides. Eel eggs may fly in on the Vinegar Flies. Best to keep your hygiene standards high and keep your ferments covered with a tight weave or paper cloth. Turbid or Cloudy Ferments. A ferment that is cloudy and turbid may happen from different sources. May be the tea used, stressed yeast, proteins and related brewing problems, Another source may be caused by Bacteria infection. (not the usual Acetobacter or Lactobacillus species) Motile bacteria (those with flagella) can swim. Their movement will create a uniform cloudiness (turbidity) in the brew. Non-motile bacteria with waxy cell walls tend to float at the surface of the broth, producing a surface membrane called a pellicle/ mushroom/ SCOBY. Other types of non-motile bacteria sink to the bottom of the tube, forming sediment. Some of these bacteria tend to stick together in clumps called flocculent growth. (shown above on the left). Vinegar eels, shown above on the Right also create a turbid brew. Usually seen swimming at the top and along th rim of the mushroom. They are also feed on the brown sludge - referred to as "Squidles" in kombucha parlance. This sludge is spent yeast cells. Vinegar eels are grown by Tropical Fish breeders and hobbyists for food. The acidify the water and place apple or fruit slices to encourage their population. Old Kombucha (as with Kombucha Hotels that are allowed to continue over 90 days, or ferments that add whole pieces of fruit or allow large amounts of yeast sediment to accumulate. often become a breeding ground for vinegar eels. Before drinking or bottling its a good idea to filter. Filter through a layer or two of cheesecloth. Filtering will also increase the carbonation and add oxygen to the carbon dioxide - oxygen ratio. 4. Bacteria Phage. Phage will attack the bacteria. Sometimes nothing changes. Sometimes the bacteria will stop producing. You may end up with Kombucha "wine". the alcohol and not the gluconic acid or acetic acid. Sometimes no mushroom will be produced but the Kombucha Tea taste the same great flavor. 5. Humans. yep. they do all sorts of things. Especially destructive are those friends and relatives who you leave watch your place and they toss out the horrible thingy in the fridge. Most often the brew or ferment, and mushroom, all look good and smells good. But sometimes there's yeast flocculent (sludge / squidlies) on top or hanging from the bottom of the mushroom. That's normal and expected. But sometimes it looks like something strange growing below - as pictured above right..
We highly recommend all brewers and home food preservatives to refer to Minnesota's Dept of Health and their Pickle Bill and their Fact Sheets. These deal with preserving food and selling home-canned food. Their recommendation is that your food (and your brew) be below a pH of 4.0 as measured by a pH meter. Paper pH strips are cheap, easy and convenient for a quick read but not accurate for bottling. We have listed in our Library various studies and peer-reviewed articles on how safe kombucha is when properly fermented. Typically Kombucha is naturally fermented to a pH between 2.5 and 3.5 and is quite safe and anti-pathogenic to most common human pathogens. In KOMBUCHA BREWING UNDER THE FOOD AND DRUG ADMINISTRATION MODEL FOOD CODE: RISK ANALYSIS AND PROCESSING GUIDELINES author Brian Nummer consistently quotes the pH to be < 4.2. We urge all to check their local regulations. Below are pictures of good SCOBY's. They may be ugly, incompletely forming, or holes, or not uniform in color and texture. (Above) Mushrooms are usually moist. An active ferment evaporates and gives off moisture A lack of adequate air flow will dry out the mushroom. Looking and feeling leather-like. The Kombucha Tea my actually taste good and even less sour or less of a bite. The Acetobacter actually require oxygen and can not convert the alcohol into acetic acid and will diminish heading your brew towards a Kombucha Beer. Keep your ferment in a well ventilated area. The "vinegar smell" will be obvious to many. But soon be used to. (Above) When you use a SCOBY (Mother/Mushroom) starter that is smaller than the container that you are using the new Baby mushroom will start forming around it. The new growth is at the intersection of the liquid (brew) and the air. Then it thickens and grows in height. On the Above Right photo there is foam - or carbonation which signals the activity of the yeast. Here seen very active. As the activity of the yeast switch from Respiration to Fermentation The bacteria become more active and the mushroom starts morning. IN time it will grow over and hide the mother. Temperature plays a critical role.Everyone has their comfort zone. For example yeasts do better in cooler temperatures sometimes as low as 40F, while the bacteria aren't even awake until its warmer - Lactobacillus around 60F+ and Acetobacter till it hits 70F. Neither do much of anything out of their comfort zone. But yeasts will be sleepy in cooler temperatures and stress in the warm to hot temperatures. Molds as a category can be anywhere under 100F. But typically attack a cold Kombucha in the 60F. We recommend 74F to 84F. ~74 if you like your brew crisp and light and 84 if you prefer the heavier more robust brew. Mold yes it happens. It happens to beer, wine, vinegar and everybody who brews and ferments. The best way to keep the risks at a minimum is to practice good house-keeping and be clean. Importantly, we try to use a good healthy starter. We want "our" good guys (the bacteria and yeasts we want) to be in control from the start. Mold is one of opportunity. A low pH, a clean room, and a strong start. Watch the cooling down time and temperature and be prepared and have the time to do it right. Above, mold has taken over. Our SCOBY or Kombucha Mushroom never even started. The failure is usually attributed to human error. Temperatures too hot, forgetting the starting tea, weak SCOBY, etc., Here the Mold is the common mold - that is Fuzzy and looks like mold. Sometimes its hard to tell for sure. Often there are several different species. The White Spot above is the real kombucha SCOBY forming but it looks like its losing overall. ON the Left, the SCOBY seems to be forming only on the outside ring.Something else is controlling the center. When in doubt - Toss it out. Keep it simple. Most Kombucha ferments are gallon or two gallon size, with 1-2 cups of sugar and 5-15 tea bags. Maybe $2.00 worth of ingredients. Don't cry over spilt milk. Stay Healthy. Even if you were to drink a contaminated Kombucha Tea it is very unlikely to cause any ill affects. Sometimes you just don't know. Smells good. Taste good. And it may be OK. The picture above on the far right looks like Vinegar Flies (larvae) were at work. Sometimes no mushroom forms or forms incompletely. May just be weak bacteria or bacteria that have been attached my phage. Pediococcus (Above Left) is a common bacteria often found in Kombucha. It is a species of Lactobacillus. ferments cabbage (sauerkraut), Usually preferred in Lambic Beers, and kept out of Beers and Wines, but flavors Chardonnay. Produces lactic acid with a buttery taste. Helps create cheeses and yogurts. Brettanomyces (Above Right) grow in small white circular globes that eventually cling together. 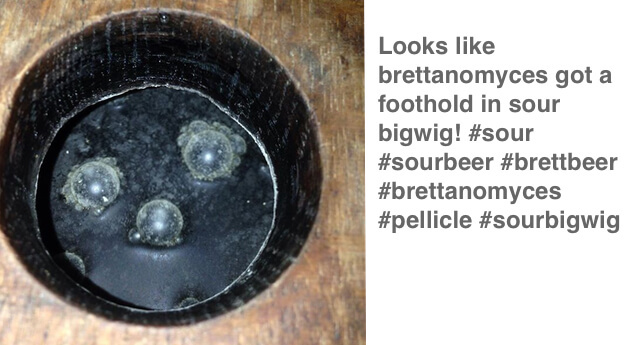 Brett is a yeasts commonly found in Kombucha, beers and wines. Both Pediococcus and Brettanomyces produce acetic acid and not all beers and wines love these guys. These are often mistaken for the Kombucha Mushroom (SCOBY) especially when they clump together. The tea taste fine - even great for some. Healthy yes. But not Kombucha - as there is no evidence that the Kombucha Mushroom (SCOBY) exists. Remember Kombucha is not a Lactic Acid Ferment as erroneously identified as such in many kombucha books but a Acetic Acid Ferment produced by the Acetobacter species (group of about 6 subspecies) that produce acetic acid and most importantly gluconic acid. Its the Gluconic Acid that separates Kombucha from the rest of the crowd. Now remember Kombucha is a SCOBY. A Serendipitous Colony of Bacteria & Yeasts If your Yeasts, for instance, your Brettanomyces, takes over and diminishes your Bacteria (Gluconobacter) - which produces the unique identifying Hallmark of Kombucha Tea (Gluconic Acid) then you're only getting acetic acid and alcohol from your yeasts (Brett) and you'll be brewing Kombucha Beer. If you're adding pieces of Fruit, Herbs or Spices to your primary ferment, or even adding after and in the Second Stage Ferment, or Bottling Stage. THose pieces may beckon spoilage and mold. Ferments have been around forever. Folks have fermented Beer, Wine, MOV, Jun, Apple Cider, Mead, Water Crystals, Passion Drinks, Cheeses, Yogurts, all safely and healthy. Just have to do it a few times and use common sense. What till you see what the beer people do for fun. Small flecks or blooms of white powder or film may appear on the surface. They may first appear as rings of white foam. If left unchecked, they grow to cover the entire surface and can grow quite thick. Saccharomyces mycoderma produce flowers of wine, This is a off-ferment of the Saccharomyces yeasts used in wine and beer making and commonly in kombucha as well. Early wine books refer to these as Mycoderma vini. This is the yeast going off on a tangent and not doing the normal ferment one expects. Flowers of wine are, of course are expected when using sherry yeast. This produces Flor, a sherry film on the surface of a ferment. Otherwise, in wines this is considered an off-ferment due to too much contact with air. In which case the ferment is then filtered or sulphites are used to save the wine. If you notice in the pictures below of fermenting beer and wine, you’ll see foam is natural and expected and produces a good ferment. 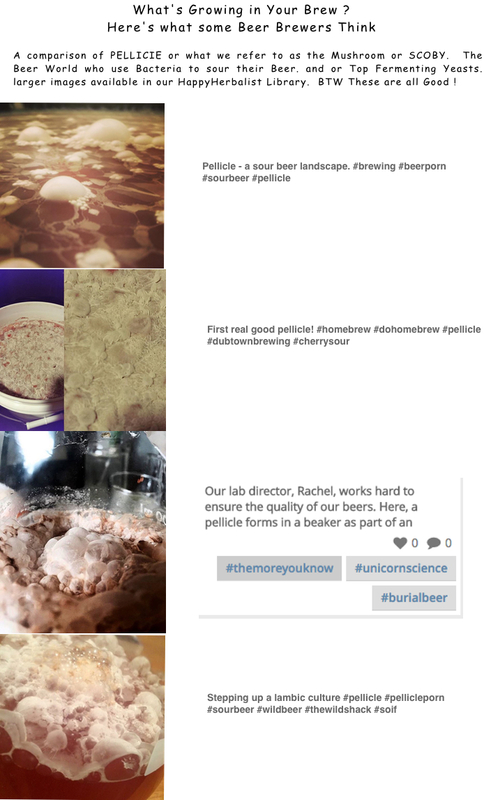 In kombucha brewing a film is expected to grow (i.e. the Kombucha Mushroom). 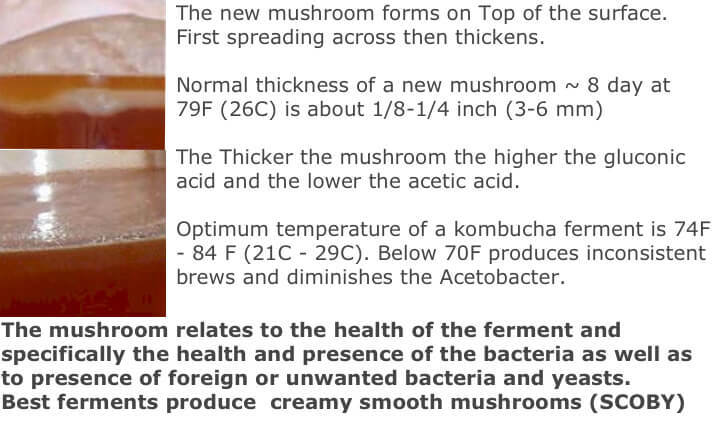 Do not confuse the Saccharomyces mycoderma (S. Mycoderma) or Mycoderma vini with Mycoderma aceti (bacteria), which produce acetic acid and gluconic acid of our kombucha mushroom tea. Flower of wine is not welcomed in popular ferments as they will consume our alcohol and acetic acid and leave water and carbon dioxide in its place. The distinction, when the entire surface is covered is not that difficult. Harder is to distinguish a film on top of the surface when it is mingled and mixed with different species. 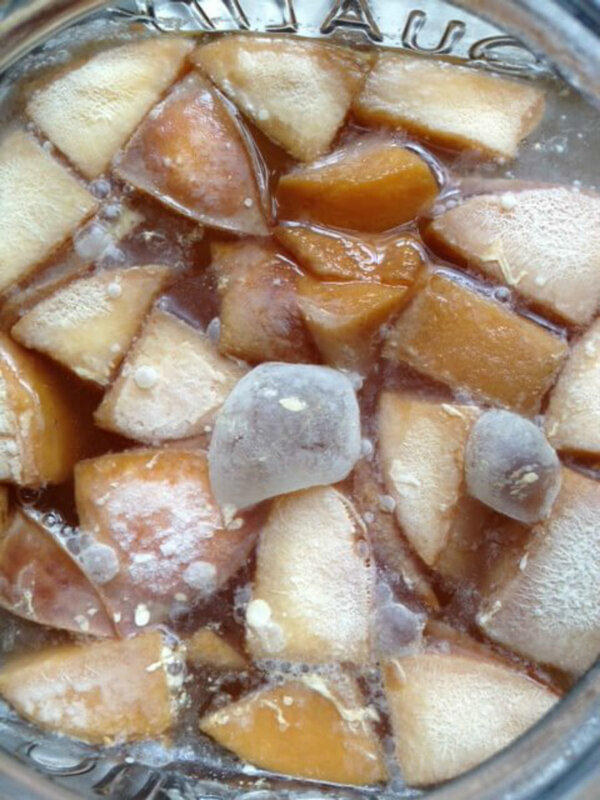 Often the SCOBY is growing and yeast gets trapped or grows with the SCOBY. Then the decision becomes, "How thirsty am I"
This small ring of white foam or flowers of wine may also appear on kefir, viili, Caspian sea yogurt and other ferments as well. Although there, they appear as a separate film or layer easily distinguished from the main ferment growing underneath. Foam also appears on lacto-ferments like kimchi and sauerkraut. 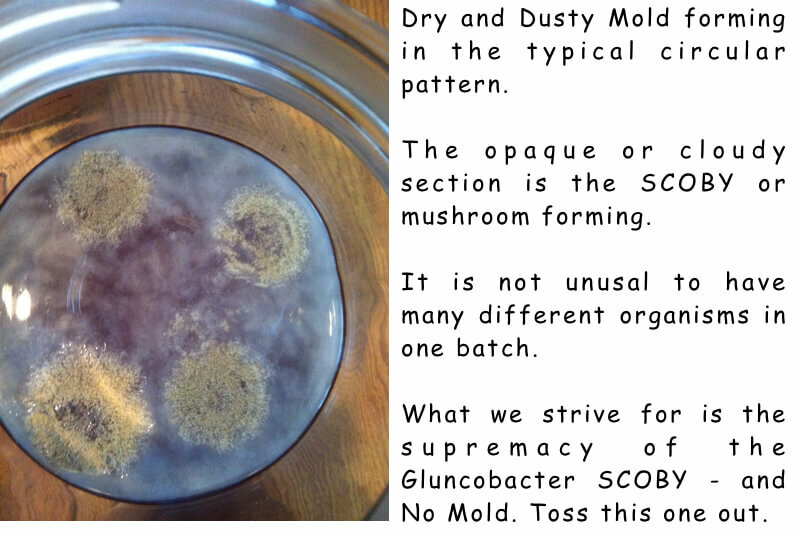 This is commonly simply removed and the ferment allowed to continue - unless it is pinkish in color (pathogenic mold). Flower of wine, according to what I could find, have not been identified as pathogenic – other than to thwart ones effort. The taste of this “flowery kefir” is quite yeasty and distinct. In he case of kefir and wine, the advice seems to be just to scrape off. It does not otherwise interfere with kefir or the next batch. In kombucha fermenting it may be more difficult to control because if it is the yeasts (Saccharomyce) may be contributing and we need the yeasts to stop fooling around and produce what we want. We may be losing our ferment, since we rely upon the present ferment to produce a starter for our next brew as well. The next few batches will tell as the mushroom becomes thinner and weaker and the kombucha tea less flavorful. The super big advantage of brewing Kombucha Mushroom over our brewing cousins is that Kombucha Tea is far far cheaper. Brews in days (9-14 days) while beer, wine, mead and vinegar takes many months to many years and cost a whole lot more. Then Kombucha Mushroom Tea is exceptional healthy and has "cured" many folks of whatever ailed them. Quite a miracle. In a very short time you'll be an expert. Your family and friends will love you. Extra Mushrooms. Create a Kombucha Hotel for all your family and friends. Simply start a new batch following you favorite recipe, This time allow to continue to ferment for up to 60 or 90 days. Add new mushrooms to the hotel as time goes on. Be sure to keep covered with a cloth. The reason for not going beyond 90 days is that as all the sugar and nutrients are used, the tea becomes more acidic thwarting the bacteria and yeast population. You want to keep your guests happy and content and ready to go out into the world. Additionally old ferments attract vinegar flies and eels. So every 60 days or so, remove the sour tea and add fresh sugar and tea. We're happy to help you on your path in any way we can. a little culture goes a long way.